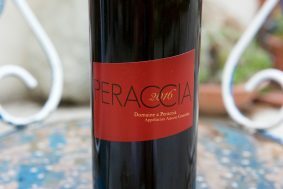 A bear of a man, Laurent Costa, the owner and vigneron of Domaine A Peraccia, is a one-man show. 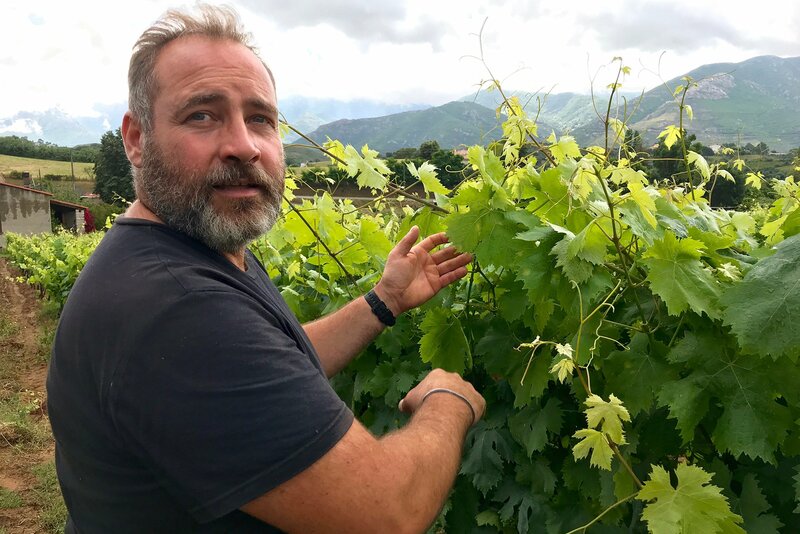 His organic and biodynamic wines mirror his high energy and warm personality. 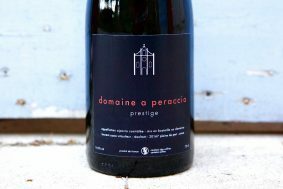 Rich in beguiling x-factors channeled by Corsica’s queen red grape, Sciacarello, and the iron-rich sandy granite vineyards soils, they are unexpectedly captivating and complex wines for modest prices. These low yielding reds (often between 1.5-2 tons per acre) are transparent in hue but maintain a full range of unique and compelling flavors replete with an unmistakable Mediterranean island character. It’s no surprise that Laurent is ex-military; he’s fully engaged, serious, intimidatingly intense and equally hospitable. When not standing still, he moves with urgency and gives off the impression that he hasn’t a second to spare, which is likely true. He does all the vineyard work by himself on all ten of his hectares. It’s hard to believe he runs everything alone because that’s a tremendous amount of land to cover for one person. However, he moves fast and powerfully, and if anyone could accomplish this feat and make wines of such grace and power, it’s clearly him. Affectionately referred to as the l’Île de Beauté by the French, and famously “a mountain in the sea” by the German geographer, Friedrich Ratzel, Corsica is one of France’s (and formerly Italy’s) most spectacular departments, and the fourth largest island in the Mediterranean Sea. With more than fifty peaks that sit above 2000 meters and the splendor of a massive nature preserve locked in by an endless amount of gorgeous beaches, it lives up to its namesakes. Wherever there are mountains there’s usually a large diversity of microclimates and geological settings. Corsica’s mountains can block a weather front from one side of the island to the next, and where there may be snow on the mountains, an early spring day at water’s edge can seem like summer has come early. 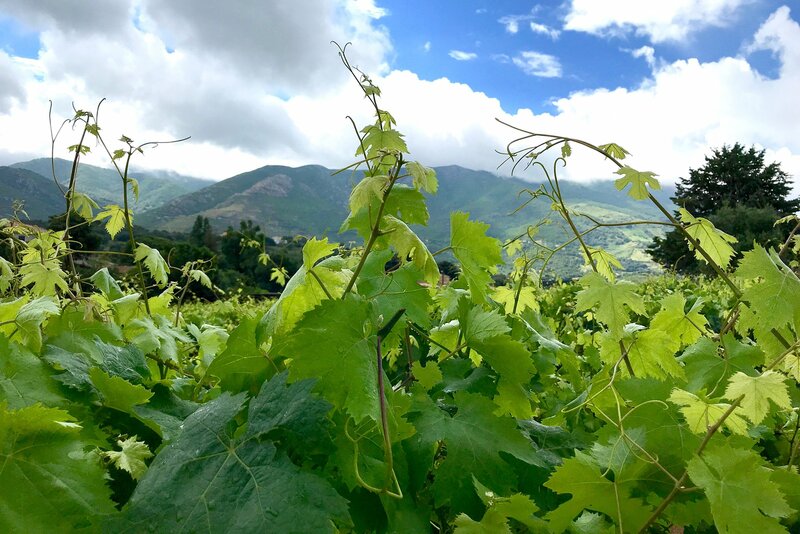 Like much of the island, Ajaccio, the island capital, has an unexpectedly strong shift in day and nighttime temperatures—a necessary balance to render wines of freshness in sun drenched vineyard areas. Geologically, Corsica is diverse but dominated by granite, which makes up around two-thirds of the landscape. The granite lands here are geologically referred to as Crystalline Corsica (named after the quartz crystals that are always a part of the makeup of the igneous rock, granite), while the other third located in the northeast of the island is known as Alpine Corsica—read more here. Crystalline Corsica is a pre-Alpine granite basement, a geological remnant of the Earth’s last supercontinent (where all land was one connected mass), Pangea. This is an ancient granite land that dates back hundreds of millions of years and it can take on many types of soil grain based on things like the size of its mineral makeup—such as how big its quartz crystals are. Granite can decompose into everything between gravels, sands and clays; all very different soil types that contribute many different qualities to the structure of a wine; stating that the soil is granite gives some important information but its influence on the wine is not as clear without a description of the grain of the soil. The ability to retain water and the mineral accessibility within a soil are determined by this factor of grain size, and all these things influence the shape of a wine—whether it be some of the wine descriptors we use, like “vertical” and “horizontal,” or references to the body of the wine, from “elegant” to “rich,” for example. The sandy granite soils in Laurent’s nature dense vineyards manage this area’s surprise rainfalls by offering good drainage, and coupled with the seemingly ever-present beams of sunlight, there’s an inherently solid resistance against high mildew pressure. The granite topsoil here is deep—sometimes more than four meters—and this sandy soil structure makes for wines with great lift and charm.